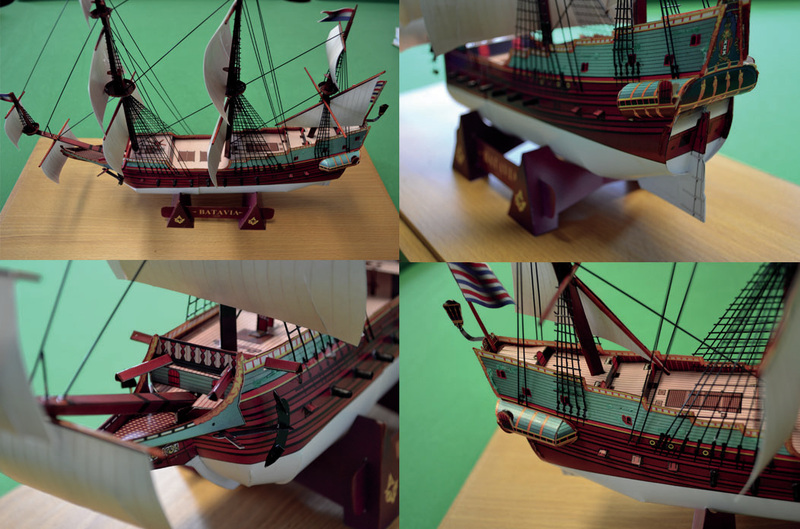 Model builders worldwide made the VOC ship Batavia in cardboard. The kit is designed on the original shipdrawings and plans. As a manufacturer we tried to design as accurate as possible. Each kit contains an easy step-by-step manual in 5 languages (see further). 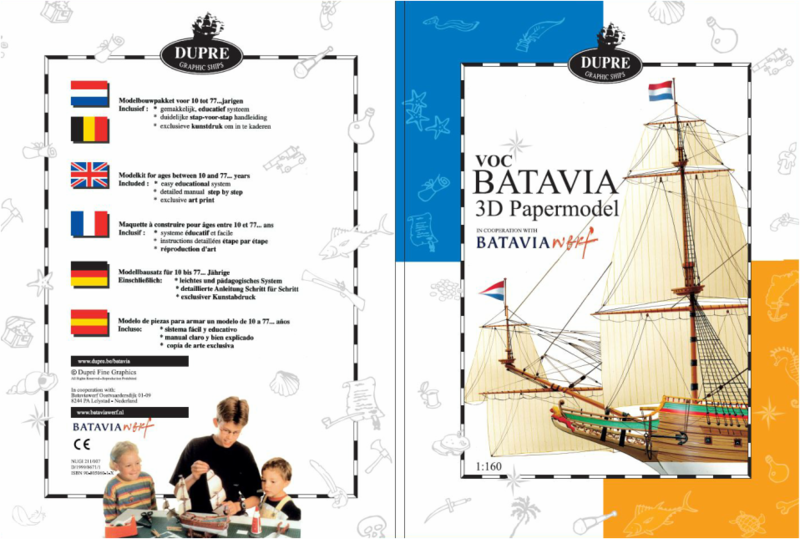 After a normal building process you'll see a very nice Batavia shipmodel that can stand along woodbuilding kits. We wish everybody who joins us a lot of success and we hope you'll enjoy the voyage! The kit is available on the yard Bataviawerf in the Netherlands. • Detailed step-by-step manual. In 12 pages we guide you to build the Batavia. Languages: English, Dutch, German, French and Spanish. • 6 Double-sided full colour printed cards of 220 g/m2 including 83 parts to build the model. The size of the cards is 22,5 cm x 31,0 cm (8,8 inches x 12,2 inches). • Luxury art print of the ship Batavia: 22,5 cm x 31,0 cm (8,8 inches x 12,2 inches). • The kit is included in a folder and sealed in a polyethylene sleeve. • Size: height: 30 cm (11,8 inches); length: 40,3 cm (15,85 inches); width: 12,9 cm (5 inches). • The kit is intended both for beginners and for the more experienced builder. • The cradle to hold the model is included in the kit. • There are no ropes included. The ropes of the model above are thin metal flower rods. One can also use black sewing thread. • Use the manual and follow the steps correctly. A lot of problems can be avoided by working step by step! Don't rush, take your time! • Try out the glue: how long does it take to dry out? How long do you need to press the parts before they stick together? Use transparent glue or glue that dries out transparently! • Use a pair of pincers to press the parts, so you can press very hard! If you don't have a pair of pincers use clothe-pegs. Anything is better than pressing with fingers! • If some parts are too small to be handled properly, use a pair of tweezers! • Folding paper is much easier when you make a soft cut with a sharp cutter! Make sure you don't cut through the paper. Try it out first and be careful. If you cut too deeply repair the parts with a piece of tape! • Use transparent adhesive tape to make the sails and make sure they have a a natural shape! Warp the parts if necessary! • The flags on top of the masts can be folded in a natural shape! Warp them while looking at the shadows on the flags! • Where the paper is sharply cut there is a white interior side visible! The model looks nicer when you paint this side with a small brush and corresponding paint. • To make the rigging of the model, use thin metal flower rods or black sewing thread. The position of the rigging is illustrated on the art print included. To make the knots of the rigging, use a pair of tweezers. • If you really want the best, you can reinforce the deck: with the remaining card surface you can double the thickness of the horizontal parts of the deck: glue a smaller surface to the interior side, but only the horizontal deck, not the blue vertical parts with the red doors! • If you make small holes where the cannons are visible, you can refine the cannons: with a needle you can warp small pieces of black paper into cylinders with a bore of 1.5 mm. Place the cylinders into the cannon-holes and glue them.